Fitness tracker is one thing you should definitely have. Its importance is limitless if you want to keep fit, watch or lose weight, monitor your heart beat, or for other purposes. 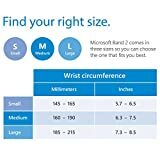 Today there are many fitness trackers out there, that getting one that is very good for you is not the easiest of things, most especially one that is tailored to meet your specific needs. For most needs, our best picks are Garmin Vívoactive, Fitbit surge, and Jawbone UP3 (for low budget). The price of fitness tracker can be anything between 10 dollars to over 500 dollars. Getting anything below 40 dollars is however not advisable as they are often associated with so many problems including poor quality and limited functionality. Why Should You Get a Fitness Tracker? Having gone through different trackers, below are our very best. Garmin is one to trust when it comes to sports wearables. They have brought out various products that have been accepted by the market. Its Vivoactive is another that has had its say. 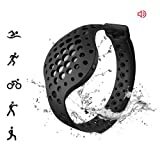 It is one of the go-get fitness trackers if what you want is something for swimming. Garmin Vívoactive Is in fact, good for general fitness tracking. It is the best bet for swimmers because it is water proof. This tracker can be used for swimming not exceeding 5ATM (50 meters deep), which is more than so many others out there. 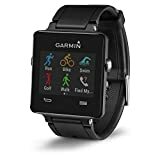 This activity tracker can as well be used for other things such as walking, running, navigation, golfing and other indoor activities. It can as well be used to monitor heart rate. The tracker is Windows, Mac, Android, and iOS compatible. High-resolution colour and sunlight-readable screen. Extended battery life that can last 10 hours in GPS, and 3 weeks in watch mode. Can be connected to phone through Bluetooth to get a vibrating alert for calls, messages, and other notifications. 204 x 148 pixel LCD. Rechargeable and built in battery. Can be used in tracking or keeping up with various activities. There have been complaints of unstable Bluetooth connection with phone. The notification function can be improved upon. 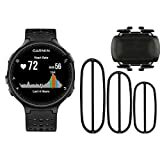 Garmin Vívoactive is not the cheapest fitness tracker out there in the market, but it has multiple functionalities, and for swimming, we can easily say it is the very best activity tracker available today. This is between an activity tracker and a smartwatch. It provides great functionalities including walking, biking, jogging, and running among others. Interestingly, it can as well track water and caffeine intake. Samsung Gear Fit2 has both inactivity alerts and automatic exercise detection abilities. What this means is that it can measure not only the amount of exercise you are doing, it will as well measure the times you have stopped. It also measures the rate of your heartbeat, however, if you consider that very important, then this may not be for you. This is because, during strenuous activities, it has the likelihood of missing beats. More so, it will require one to be still for a while to get the heart monitored. Its screen is made of gorilla glass, which makes it pretty resistant to crack or scratch. Designed with waterproof abilities to five feet down and a maximum of thirty minutes. It gets call and text notification from your phone. Has 512MB of ram and 4GB storage space. Comes with music playing ability through Bluetooth headsets. It is not iOS supported. In comparison to most others, its battery life is short. While this has its limitations most especially as regards iOS support and Heart rate monitoring, it is a significant product. It is mainly for you if you want a “not so serious” activity monitor which will serve as a smartwatch, as well as something that works specifically with android. The Fitbit Surge is not only massive among other Fitbit activity monitors ; it is also very popular and well received in the market. It has the ability to track activities including yoga, weightlifting, and spinning. More so, it tracks calories eaten, steps taken, and even sleep. It is a sophisticated fitness gadget which stretches in outlook and function. Surge is fashioned with water resistant ability. This although cannot be used for swimming, and Fitbit advises that you do not shower with it. Its resistance ability is placed by the company at 50 meters. It comes with a USB dongle which helps in connecting with your computer. This makes sure that once you get close to your PC, your exercise and activity data gets wirelessly synced to your account. You can as well use the app for this. It comes in small, large and extra large sizes. Has auto sleep and silent alarm functionalities. It has music player support. Has 1.25-inch monochrome LCD touchscreen. When GPS is turned off, its battery life is good enough to last 5 days with continuous tracking of heart. Tracks all activities of the day including floor climbed, burned calories, as well as active and inactive times. Is it worth the money placed on it? Yes, it is. It is your bet if you are looking for something with high GPS, which can track extended activities. If you love Fitbit products, then you will as well love this, because it is their overall best product yet. The Fitbit Charge 2 is definitely one of the best there is out there. It is an upgrade of Fitbit’s Charge HR, which is as well a good tracker. The tracker comes with the functions of monitoring activities such as walking, running, biking, weight lifting, and hiking. More so, it records your workout and monitors sleep and heart rate. It also tracks your burnt calories. With so many trackers out there, this tracker has provided so many things provided by others in different ways and some things not provided by others. It has a nice design for comfort, and above the bar functionality, which makes it nearly impossible for any good list to leave it out. Windows, Android, and iOS compatible. Up to five days battery life. Has PurePulse Heart Rate which continuously tracks heart rate. Provides call, text, and calendar notifications. It has side buttons for control. You can as well control using the touch screen. Unless what you want is something for swimming or a GPS-enabled tracker, this could be the best option for you. This is a great fitness companion if you are good with something really simple. It is a tracker without a display, however, there are many things that make up for that. These include its ability to control connected devices through a button, as well as automatic tracking of steps, distance covered, calories, and sleep. Misfit Ray is made in a very friendly way, apart from it being nothing like the traditional tracker, it gives the opportunity to easily change the band, battery, and customise its functionality. This means that you can add activities you want, although those would only be recorded and not compiled towards meeting a target. Although some people find this fashionable, it is not as fashionable as Jawbone UP3. It is made with replaceable batteries that can last for six months. Alerts for calls and text messages. Its cylindrical shape makes it easy to wear as a bracelet. It gives an almost accurate measurement. It has no display for real time tracking. While this is a good fitness tracker, it does not do more than the basic things. If what you want is something that could take you through serious training, then I guess this is not for you. However, if you want something just for keeping fit and motivating you, then you can as well keep your money on this. Unless you want its specific features, I will not advise you go with this, mainly because for a basic activity tracker, it is not cheap. With some additional money, you can as well get The Fitbit Charge 2, which will give both better and additional value, or Moov Now which is cheaper. This is Microsoft’s second attempt at making an activity tracker. So far, it has achieved better result than the first, and it has gone above many others. The Microsoft Band 2 has been designed to do so many things. It is, however, most suited for you if what you want is to watch your health as you keep fit. It monitors your heart rate, calories burnt, and the quality of your sleep. Its provision of health app is as well important. It tracks activities including walking, stair climbing, running, biking, golfing, sleeping, and many others. Compatible with Android, iOS and Windows. Provision for health insights from data generated by Microsoft health app. It has a generous OLED touchscreen Gorilla Glass display. Compatible with Windows, Android, and iOS? It blends activity tracking with a smartwatch functionality (if I can call it that). It is not waterproof, hence you cannot use it for swimming. Lasting only 48 hours, its battery life is definitely not the best. Beautiful but not completely comfortable. It could be friendlier to android and iOS. It is not a very cheap tracker, however, based on its abilities and if it suits your specific needs then it is a good buy. Its battery life is not necessarily the best, however, considering its massive functions, it can easily be allowed since it can last for two days without charge. Overall, it is a good bet. I would say that this is the most fashionable piece of tracker you can have. Although that can be argued, most would go with me. This Jawbone tracker is done in a way that one would hardly think it’s a tracker. Essentially, it is for you if you want a fashionable tracker. The tracker monitors calorie intake and calories burnt, distance covered, steps, and sleep time among others. It also measures heart rate, although this is not continuous as it is only done when you sleep. It is mostly prominent for measuring accurate steps and sleep. Unlike most other fitness trackers, Jawbone UP3 works better when you are asleep. This is mostly as regards analysing your body temperature, respiration, mood, and heart beat rate. The idea behind this is that it can best analyse your general health by checking on you when your mind is at rest in sleep. The record can only be accessed after connecting the device to your phone through Bluetooth. It uses LCD flashlights to alert and notify. It’s iOS and Android compatible. It is not waterproof; only handles splash. Considering it has a seven-day life battery, that is quite impressive. It is very convenient as it is very light. It does not have continuous heart rate monitoring. This could have been more than just a good activity tracker if it were made with LCD display. Notwithstanding, it is one of the best out there, competing with Fitbit Charge HR. It is a product you can easily go with if you do not mind that it cannot perform some functions without having to sync it. More so, if you want something to monitor your heart and health, this may do since it analyses your general body when it is at its most ‘normal’ state in sleep. It also provides other useful health information. The Garmin Forerunner 235 is a running watch and fitness tracker which is quite interesting in its right. This tracker which is an upgrade of Forerunner 230 is best for you if you want to monitor running or cycling, and in between, monitor your heart rate. Tracks activities including running, biking, calories burnt, steps, and sleep. You can make use of heart monitor strap. With a downloaded app from Garmin, you can customise easily. Designed with optical heart rate monitor. It counts your steps and burnt calories all day. Text, call, email and other notifications from phone. You can use it to control your music. It doesn’t have the best screen as it is very much easy to scratch, so having a screen protector may be important. It is supposed to be more of a running watch than a fitness tracker; still, it performs more than a running watch. It is one that could be very important for you if you are seriously into running. Among many other running watches, this stands out in so many ways including its very good optical heart rate monitor. Another from Fitbit, this tracker is a sleek product which tracks different activities including running and sleeping. It as well records steps, stairs climbed, distance covered, and burnt calories. The tracker has a feature of continuous heart rate monitoring. The Charge HR allows you to get call notifications from your phone, it is Windows, iPhone, and Android compatible. While it is a good product, it has some limitations including not being water resistant and lacking GPS. Instead of getting this product, we would suggest Fitbit Surge or Charge 2, which was designed to be an upgrade of this. Apple has taken the challenge to producing a smart watch as good as its traditional products. It has by far not failed with its Watch Series 2, which is its second attempt. The smart watch doubles as a fitness tracker which comes with GPS, water resistance ability, and heartbeat monitoring. It gives notification from your phone and tracks activities such as running and swimming, and its heartbeat monitoring is above the average, though not as accurate as it could be. More so, its battery life could be improved upon. This is as good as most things from Apple, except that it is only iOS supported, and it is relatively expensive. However, when we look at its general functionality and versatility, it is one to get except if money is an issue. This is not as expensive as most others on this list, however, it performs quite good. It is more of a sports coach. Strapped to your ankle or wrist, this device gives you audio instructions, which can be very motivating. It gets interesting that this device also tracks your active moments. The problem with this tracker is that it has no display, so you will need your phone to get feedback. Trust me, this is no big problem since it gives audio coaching as well as other feedback. Our take on this is that it is probably the best fitness tracker for newbies. Motivation: most trackers are designed to help motivate you as you set goals, and they show you how you are progressing. Keep in shape or lose weight: once you can keep your own part of the bargain, a good tracker should motivate you towards burning unnecessary fat and keeping in shape. It adds to your health: apart from the health benefit of your workout, most trackers would monitor your heart rate, which would keep you watching your heart. Accountability: once you set goals with your tracker, it would monitor you and tell you how you are doing, which will help you in being accountable. Generally: a good tracker should help you monitor your sleep (how much rest you have), steps you take, the distance you cover, monitor your heart rate, and do other things. That said, one does not necessarily need a tracker that can do everything, hence it is best to find the one that will fit your needs and activities. The best trackers today have surpassed what they used to be in so many things including functionality, durability, quality, and user-friendliness. Above meeting your specific needs, before dipping your hand into your wallet, be certain that the fitness tracker you want to buy is the right one for you. This is in terms of compatibility with your device, and that it is accurate enough not to mislead and confuse you. More so, remember that the best activity tracker for one person may not be the best for you. Hence you will need to check through to see that its display, battery life, and style are all things you will be comfortable with, unless you are comfortable with it, you may not be able to get the best out of it.